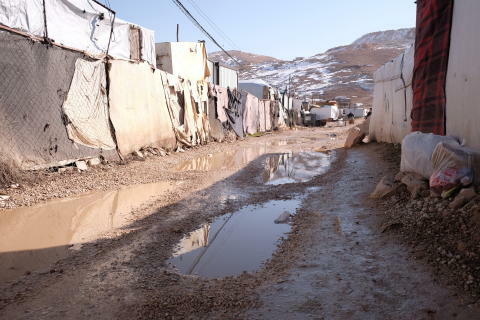 London, January 30, 2019 - Storm damaged emergency sanitation systems in Bekaa Valley refugee settlements in Lebanon have collapsed, leaving more than 350,000 people at risk of disease, exposure to the elements, and relocation. 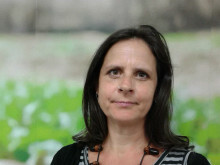 "Our teams are working against the clock, not only for the emergency response to the cold snap but also to launch improvements in the camps capable of mitigating the impact of future storms expected over the next two or three months," explains Beatriz Navarro, director of Action Against Hunger in Lebanon. 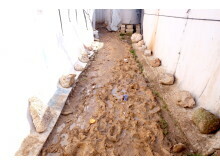 "The refugees' tents are very close to each other and do not have adequate drainage systems. The refugees have dug canals, but not deep enough to divert the amount of water from the latest rain and snow storms. In addition, previously constructed drainage channels tend to be filled with garbage, resulting in dirty water flooding into homes." During Storm Norma on January 6, irrigation canals filled with water too fast and flooded a line of shops, forcing many families to relocate. Two weeks later, on the outskirts of Aarsal, Storm Miriam caused heavy mud flows hit the camps, and septic tanks overflowed, taking more than a week to clean up and make it possible for families to return to their homes. Action Against Hunger have distributed pallets so that families could keep mattresses dry on the still wet ground. Due to the persistent rain and snow storms, more and more people, particularly children and the elderly, are also contracting flu, pneumonia and fevers. "The camps surrounded by irrigation channels are not yet completely dry after the storms and have become fertile ground for bacteria and poor hygiene conditions. Despite people's efforts to maintain minimal personal hygiene and clean homes, the mud simply does not allow it," says Navarro. "To compound the situation, the population of the camps have extremely limited income to purchase medicines, food and blankets, and are completely dependant on foreign aid during the winter months. Action Against Hunger teams are conducting awareness sessions for children about the importance of proper waste management and keeping the camp environment clean. "We have also distributed garbage collectors and bags, but problems arise when the generated waste is greater than the frequency with which the municipalities collect it." 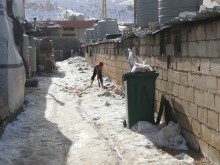 On January 6, 2019, Storm Norma saw heavy rain and snow, high winds, and freezing temperatures hit vulnerable communities across Lebanon, with some areas badly affected by floods, erosion, and heavy snowfall.